Mehman Huseynov is a young anticorruption blogger who has been imprisoned since March 2017. Mehman has documented the deteriorating political freedoms in Azerbaijan through powerful photographs that captured the world’s attention, and received the Norwegian Nobel Institute’s Press Prize. On March 3, 2019, Mehman was freed after serving the full length of his sentence. December 26, 2018: Authorities charged imprisoned anticorruption blogger Mehman Huseynov with “resisting a representative of the authorities with the use of violence dangerous to [the representative’s] health and life” only two months before his sentence was anticipated to end. Mehman reported to his lawyer that he was pulled aside during a routine inspection where he was to undergo an additional search. When left alone with a prison official, the man fell to the ground and faked being attacked. “Huseynov’s lawyers requested access to the surveillance videos from the area, but officials have said the surveillance cameras don’t have recording memory cards,” reports a statement by Human Rights Watch. On January 22, 2019, authorities dropped additional charges against imprisoned anticorruption blogger Mehman Huseynov. For over three weeks, Mehman undertook a hunger strike in protest of the unfounded charges. In solidarity, a number of current and former #SetThemFree political prisoners joined the hunger strike including: Khadija Ismayilova, Tofiq Yaqublu, Giyas Ibrahimov, and Ilkin Rustamzade. Zafar Ahmadli, the father of political prisoner Fuad Ahmadli, also joined the hunger strike. April 12, 2017: Mehman’s defense lawyer requested to present witnesses to the court of appeals who would testify that Mehman had been beaten and tortured in prison. The court failed to appropriately investigate this issue and in December 2017, Mehman’s appeal was dismissed and his two-year sentence was upheld. March 3, 2016: A Baku court sentenced Azerbaijani human rights activist Mehman Huseynov to two years in prison on “defamation” charges. He is the Chairman of the Institute for Reporters’ Freedom and Safety (IRFS), an Azerbaijani organization promoting freedom of expression. Three days before receiving his sentence, Mehman produced and shared a video about the appointment of Mehriban Aliyeva, Azerbaijani President Ilham Aliyev’s wife to the office of First Vice President. The video features Mehman asking passersby if they would also appoint their wife to a vice president position if they were a leader of a company. Nearly two months before his imprisonment, unidentified policemen abducted and tortured Mehman. The next day, January 10, 2017, Nasimi District Police fined Mehman for “disobeying the police.” The previous head of IRFS, Azerbaijani journalist Rasim Aliyev, served as Chairman until his tragic death on August 9, 2015. Unknown attackers murdered the influential journalist during a brutal crackdown on Azerbaijan’s civil society. Mehman’s brother, and IRFS founder Emin Huseynov has also been a target of severe police harassment. 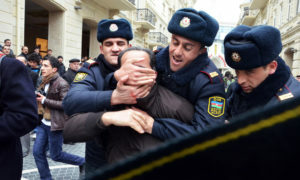 The European Court of Human Rights found that the Nasimi District Police were guilty of torturing Emin two years ago, before he fled Azerbaijan due to intense state-sponsored harassment. In October 2015, Emin received asylum in Switzerland, where he now resides. Mehman has documented the deteriorating political freedoms in Azerbaijan through powerful photographs that captured the world’s attention, and received the Norwegian Nobel Institute’s Press Prize. In 2012, the World Youth Movement for Democracy (WYMD) selected Mehman’s powerful photograph of Azerbaijani police brutality against citizens as a winner in the “Youth in Action: a Snapshot of Democracy” contest. The photojournalist’s brave reporting has made him a frequent target of extreme state-sponsored harassment, including arrests, travel bans, interrogations and assaults. “I live in Azerbaijan where I never saw democracy. The fundamental freedoms of democracy are freedom of expression, freedom of media, freedom of assembly, property rights, etc. These freedoms and rights are restricted in Azerbaijan. Sometimes, you see people’s rights violated, but you cannot speak or write about it. In this photo, the police have covered the mouth and the eyes of the man so that he can neither see reality, nor speak about it. This is how democracy exists in Azerbaijan.” – Mehman Huseynov’s WYMD entry about freedom of expression and police brutality in Azerbaijan. Click here to join us in calling for the immediate and unconditional release of Mehman Huseynov by sharing this solidarity tweet!